After the Hawks clawed their way back to tie Dat’s Ya Problem at 8-8 in the top of the seventh inning, a walk, stolen base, two more walks including the second being intentional, saw Dat’s Ya Problem putting the game in the hands of rookie batter Brianna Brewley, in the bottom of the inning, with the bases loaded. 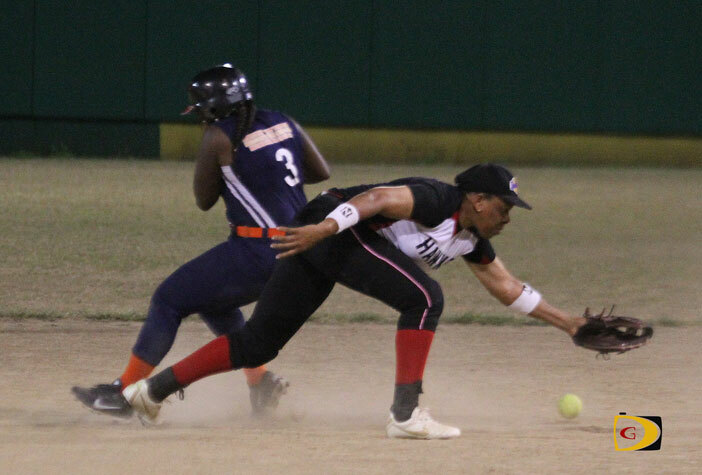 “Honestly, I was just panicking,” Brewley said after she lined a solid hit to center to give Dat’s Ya Problem a thrilling 9-8 victory over the during Sunday’s Virgin Islands Baseball Softball Association Harriette Skelton League at the E. Walwyn Brewley Softball Park. Teammate Valissia Brathwaite also had a 2-for-3 game to help secure the victory for Shaika Jeffers. Diana Hunt took the loss for the Hawks. Jheane Niles of Hawks went 2-for-4 with 2 doubles and 3 runs batted in and Shanika Forbes had a 2-for-2 game with two runs scored and a run batted in. The Hawks were coming off defeating the West End Warriors, 18-9 in Friday night. The Lady Pirates defeated Walk Off 15-6 in the other women’s game, Perline Scatliffe-Leonard was the winning pitcher and the loser was Darier Malone. Khiayah Doward of Lady Pirates went 3-for-4 with 2 runs batted in. Shereen Sprauve finished 2-for-4 with a run scored and drove in two. Shakeeya Collins homered for Walk Off. In Men’s play, Power Outage crushed the A’s 18-2 to close out play on Sunday, after shutting down the Mobsters 8-0 on Sunday. Dariel Robinson was the winning pitcher while Jayque Hopkins took the loss. runs batted in. The A’s were coming off a 13-12 loss to the Pirates.